At long last I drove north on Friday evening with the prospect of two whole days of good weather in the hills. So much more refreshing than Keeny smugly telling us how great the weather had been on Friday as the rest of us eye up dismal forecasts for the weekend. Everyone grasped the nettle and hurled themselves at the mountains with gusto. The weather lived up to expectations and despite some squally snow showers, there was plenty of fine spring sunshine and great views. Tim and Martin were determined to get one last winter climb done before the ice finally melted and were up with the larks on Saturday morning. Aiming high on Ben Nevis, they were the first team on Good Friday Climb and enjoyed thin but solid ice. The rest of us were scattered widely on an eclectic mix of hills. Pete and Sara went on another Mamores Munro bagging mission, with Binnein Beag their target this time round, while Nigel, Alison, Fiona C, Bill and Eileen climbed Glas Bheinn from The Dark Mile. Once they’d managed to negotiate an area of recently felled trees, they enjoyed fine views of the Loch Lochy Munros. Not content with just one hill, Nigel drove back to Loch Leven to climb Tom Meadhoin and watch the sun set over the peaks of Glen Coe. Further west, Ian L and Allan climbed Sgurr Dhomhuill on Ardgour and Allan returned raving about the oak woodlands on the approach. Mike and Keeny had a car free day and took the ferry to Corran before climbing Druim na Sgriodain. Paul and I enjoyed the classic circuit of Sgurr Thuilm and Sgurr nan Coireachan from the Glenfinnan viaduct. The sunshine appeared just in time to enjoy the high level traverse between the two peaks, with the views stretching from Knoydart to Skye, Ardgour and Ben Nevis. 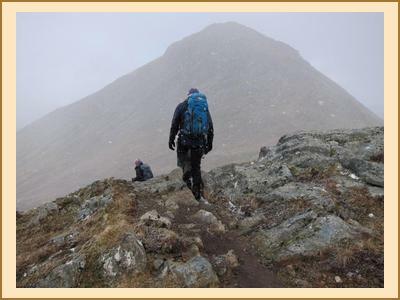 Rebecca and Anne completed an energetic day of hill walking with a round of The Ring of Steall in the Mamores. And after a great day on the hill what could be better than taking the ferry to Ardgour for a pint in the pub? We woke on Sunday to glorious sunshine and a cloud inversion hanging over Loch Linnhe. Despite an early start, Keeny, Alison C and Anne were beaten to Tower Scoop by hordes of faffers so shelving their plan to climb this route before Gardyloo Gully, headed straight for the gully to climb the mystical ice tunnel. It lived up to expectations and they emerged unscathed after spiralling their way up through the tunnel. Pete and Sara also had to modify their plans and ended up climbing Number Five Gully. Having climbed the same number of Munros on Saturday than I managed in the whole of last year, I went one better on Sunday with an ascent of Gulvain along with Paul, Martin, Tim and Rebecca. 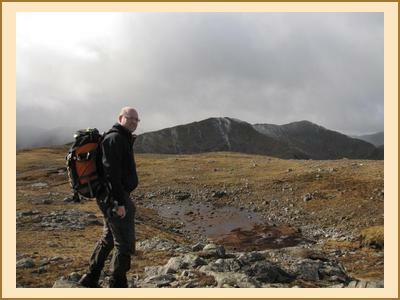 Nigel was also in the area, bagging another Glas Bheinn and Meall nan Damh to continue his onslaught on the Grahams. Some folk headed south for their hills, with Mike, Ian L, Allan and Fiona C traversing Buachaille Etive Beag while Bill and Eileen drove most of the way back to Crianlarich to climb Fiarach. Ian E eschewed all of this ambulatory activity in the mountains for two days of gruelling cycling on his road bike. Saturday saw him out for a 7 hour spin to Kinloch Hourn and back (120 miles) followed on Sunday by half that distance on the Ardgour peninsula but taking in some very steep and twisting roads. There’s always room for another zealot in the EMC. As I write this, the fantastic spring weather continues. But is it summer? Last year April was the new May but this year I fear March may be the new April. Its all so confusing! No point trying to make sense of it all, just get out there and enjoy yourselves before the midges arrive.